Last Christmas as I walked down George Street, Sydney City, I saw an ‘older scruffy’ man with a pile of boxes selling Christmas hats. I smiled at him (I’m a serial smiler) and just kept on walking by. 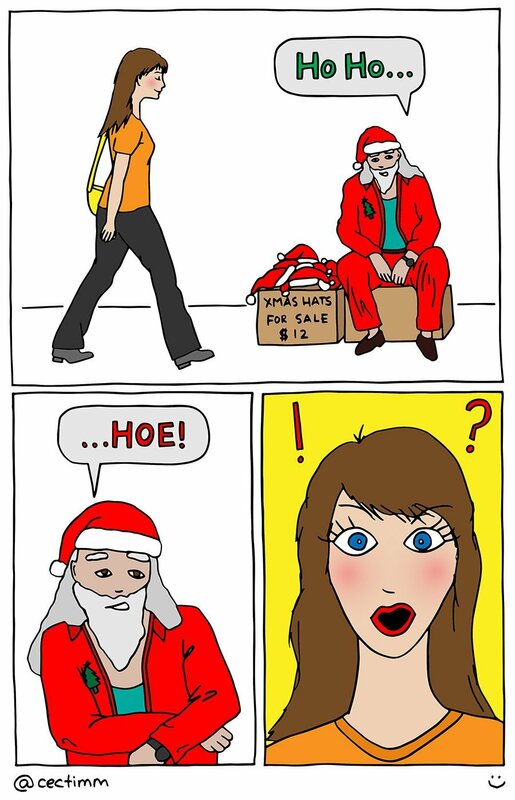 As I passed him he said “Ho Ho…” and naturally I was expecting to hear the third “Ho”. Instead his tone changed and when he realised my smile was not signifying an intention to buy, he spat out a nasty “Hoe” instead. I laughed my head off. I thought this was brilliant and creative. After all he is entitled to his opinion (even if it’s very misguided).